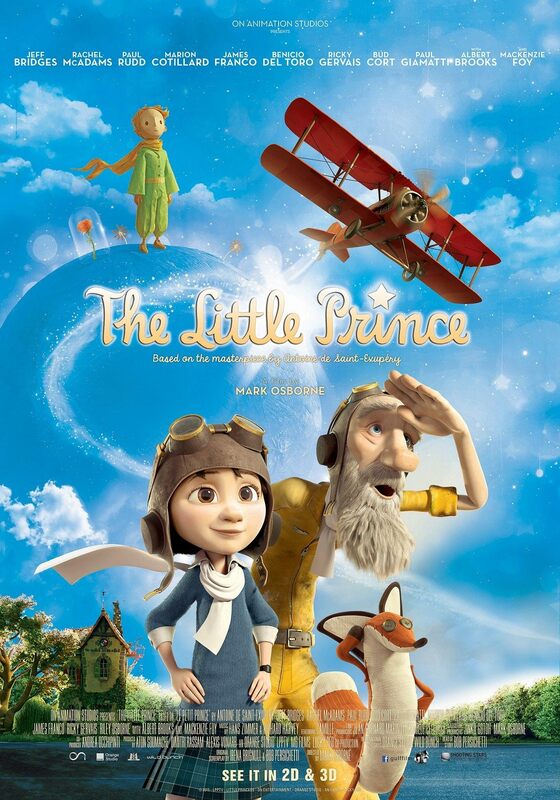 For a while watching The Little Prince I was ready to come on here and be pretty harsh on it. Until the first hour mark, the movie was honestly driving me crazy but then it somehow turned itself around and became a decent flick. Usually the ending of films is where they really tank but not in this case. I kind of wish it had been a short 45 minute special because really the first hour is just two characters talking a lot and telling you why what they are saying is so important. SOME SPOILERS AHEAD! (I couldn’t talk about some of my issues without spoiling because it lay within the story). So let’s talk about that first hour. My big problem was way too much exposition. At times it felt like a Shyamalan film there was so much talking and not showing! The plot of the movie is a Little Girl is trained by her mother to keep a tightly planned study schedule. Truly it seemed a little over-the-top it was so micromanaged. I mean what kid would want to plan a play date for the next summer? It strained credulity and made the Mother look really mean. The goal of the Mother is for Little Girl (that’s her name) to make it into a prestigious school called Werth Academy. They even move just to be in the school boundaries. 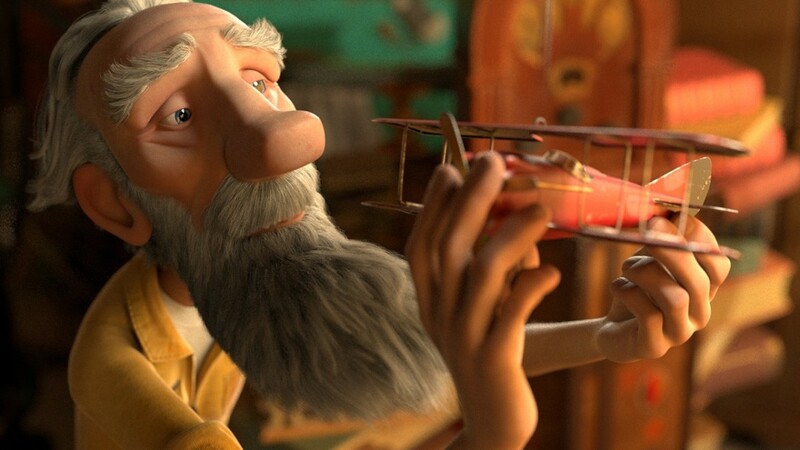 However, Little Girl wants to explore and is drawn to an elderly neighbor known as The Aviator. 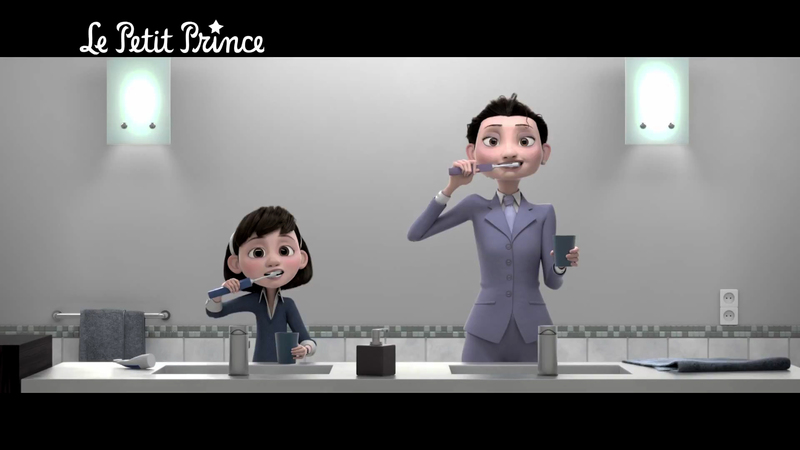 He tells her about the Little Prince who had a rose that he loves and tries to protect. As he tells the story we see it played out in beautiful animation that looks like stop motion. The problem is not enough happens in the story to be compelling on its own so it becomes a lot of talking about dreams and bold living. As pretty as it was I grew weary of it. Then The Prince in the story dies for The Rose at the hour mark. 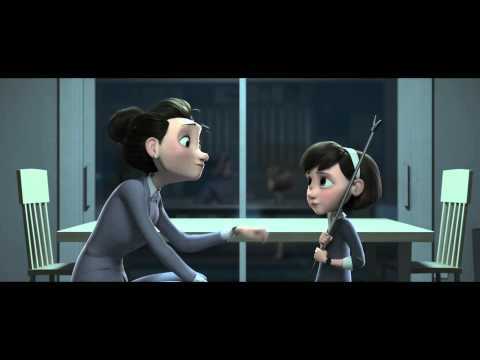 This causes Little Girl to become angry at The Aviator for the story and it ending so sadly. She stays away but then he gets sick and she must fly The Aviator’s plane and find the Little Prince on his asteroid. This is when the story starts going. We actually see things happen to our lead character! When the Little Girl gets to the asteroid, she finds a world where everyone has grown up- kind of an opposite Neverland. The Little Prince has forgotten his past and has been turned into a workaholic adult. He is ruled by a man called The Businessman who is hoarding all the stars to steal all the light and happiness from the world. Now this is a story! Little Girl then must bring the Little Prince back to his planet and he gets some closure on his lost rose. Little Girl gets a reminder that she cannot grow up too soon. When she reunites with her Mother they have a new understanding and she is allowed to be a child a little bit longer while still going to the prestigious school. Once the action in the story started going I was entertained by the Little Prince, but almost like a fable, the metaphors are very heavy-handed. The Businessman clearly is meant to symbolize the Mother and her routine for Little Girl (they even have a similar chalkboard with tasks listed out), but I didn’t mind it. I kind of wish the entire movie had started at that point because I really didn’t need the background on the Prince, The Rose, The Girl and The Mother. Even in the boring sections there is a nice heart to the film, and I did feel attached to Little Girl and her struggles to be understood by her Mother. I just needed something more concrete to happen sooner to get the plot going. The first hour felt a little like reading a greeting card. Sure it looks nice and has a nice message but I needed more story! The vocal performances are all wonderful, providing a real warmth to the sometimes one-note characters. Mackenzie Foy (Little Girl), Jeff Bridges (The Aviator), Rachel McAdams (The Mother), Paul Rudd (Mr Prince) are great. Marion Cotillard is heavily billed and I thought would have a big part but she is The Rose and only has a few lines. 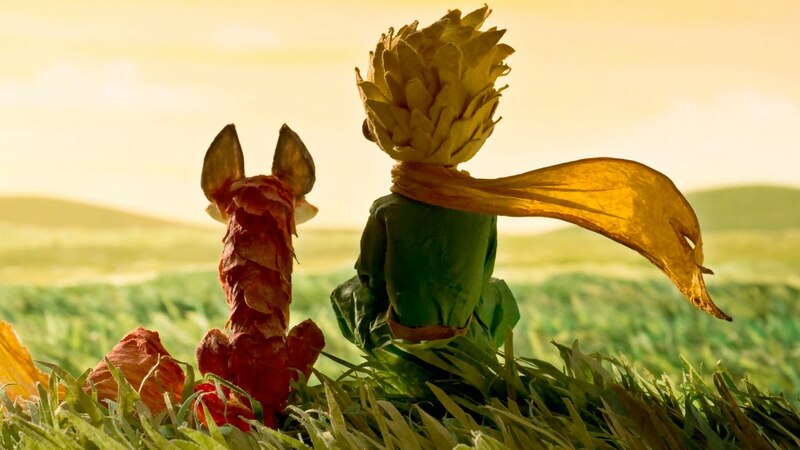 The animation is stunning throughout The Little Prince and it is worth seeing for that reason alone. And it does end with real heart that made me tear up a few times. I just wish I could condense the first hour into 15 minutes! In some ways after that reminded me of Neverending Story in its messaging and tone. Still, I can’t ignore an hour of tedious exposition. Also why this movie took forever and a day to get to a US release is beyond me. It was written in English originally so it didn’t need dubbing or subtitles. Why the delay? That was very annoying. Huh? It was the other was around for me. The first hour was GREAT! It did so well capturing the spirit of the book (though it would have done even better if it had shown more of the stories and not just two or three), and then they had to go and ruin it in the end by turning it into a generic movie with no understanding for what The Little Prince is actually about. The book is more or less that…the pilot meets the Little Prince, and the Little Prince tells him about the story of his travel. The stories are not just stories, though, they have a deeper meaning. The Little Prince basically provides a children’s view on the world of the adults, and how they sometimes obsess over things without much meaning. It’s a serious discussion about relationships, too, and about accepting different view-points (that’s what the story with the snake who eats the Elephant is about). Cool. Thanks for sharing that. I will have to read it. I skipped reading this as I didn’t want to be spoiled. Pingback: Animated News 3/17 | Reviewing All 54 Disney Animated Films And More! Pingback: Animated News 3/24/16 | Reviewing All 54 Disney Animated Films And More!